Maybe you’ve heard of the grammar gene—its technical name is the FOXP2 gene—which may be responsible for a variety of grammatical ills, such as the inability to construct compound/complex sentences or to effectively deploy the passive voice. Now there’s evidence that a variant of that gene, FOXP2.1, may actually cause us to obsessively correct other people’s grammar, or should that be, to correct their grammar obsessively? The discovery of this gene, alongside new evidence from fMRI scans of brains exposed to real-time grammatical errors, has led some scientists to predict that soon we may be able to find a cure for GPS, for many sufferers a debilitating, off-putting, sociopathic syndrome. At least that’s the conclusion of two researchers writing in the current issue of the Journal of Syntactic Cognition. A team led by L. Malevich and H. D. Lo studied the fMRIs of self-identified grammar sticklers as they were exposed to a variety of solecisms ranging from split infinitives and sentence-final prepositions to phrases like between you and I and apple’s $2.49 a bag. 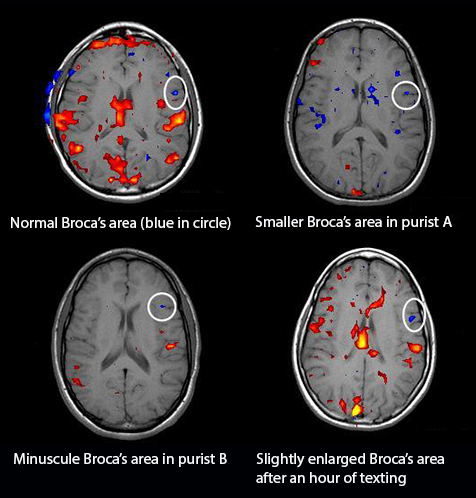 The fMRIs of the language purists showed markers of brain activity also commonly observed in OCD/ODD patients, along with several surprises: Wernicke’s and Broca’s areas, the parts of the brain associated with language, were actually smaller, or exhibited reduced activity, in grammar sticklers and language purists, than in normal subjects. DNA analysis showed they also had a higher likelihood of having the FOXP2.1 gene than the general population (Len Malevich, Hi Ding Lo, et al., “Correlation of instances of grammatical pedantry with the expression and suppression of an underlying FOXP2.1 gene” JSynCog 34.3: 1135-39). fMRI scans of normal and GPS brains, from the Journal of Syntactic Cognition, used by permission. According to Malevich, identification of an underlying physiological basis for this alienating disorder could eventually lead to curative stem-cell treatment plus, in the near term, the development of pharmacological palliatives. There’s even a push to add GPS to the DSM-5, the latest edition of the standard catalogue of psychological disorders, scheduled for publication in 2013. Malevich and Lo, as well as other cognitive syntacticians, are convinced that classifying linguistic purists and grammatical pedants as obsessive-compulsive could go a long way toward explaining why a group of people so convinced that they are right can be regarded by the rest of us as, well, a bit off. Interpreting the data, Malevich concludes, “grammar rules feed the desire of OCD sufferers to impose normative order on language that seems to them to be out of control,” and those exhibiting oppositional defiant disorder “revel in their ability to flout social conventions and correct other people’s language even when it is perceived to be rude or insensitive to do so.” "Or," he asked, "are they flaunting those conventions?" But with the shuttering in recent years of many of our mental health facilities, and an increased focus on patients' rights, more and more compulsive grammar correctors are roaming our streets unchecked. GPS goes a long way towards finding, explaining, and helping us deal with, their obsession with enforcing on the hapless public an idiosyncratic and often undertheorized idea of what’s right or wrong in speech and writing. If defining this kind of intrusive purism as a psychological syndrome helps us find a cure, then ultimately both society, and language itself, stands to benefit. Or is it that they stand to benefit? So, from this argumentation follows that everybody, who take their line of work very seriously and therefore feel a need to correct everyone, who&apos;s doing it wrong, are actually suffering from an OCD, and that everyone would be better off if this "disease" was cured? And it should of course be mentioned that the acronym GPS is completely congruent with the most popular non-technical term for this condition, namely Grammar Police Syndrome.